The leading independent specialist for windscreen replacement and windscreen repair based in Newcastle upon Tyne and serving all of the Newcastle upon Tyne area. National Windscreens Newcastle upon Tyne fitting centre provides windscreen replacement and windscreen repair services to businesses and individuals throughout Newcastle upon Tyne and the Newcastle upon Tyne area. Newcastle upon Tyne is situated in the North East of England on the River Tyne. The city is 8.5 miles from the North Sea and is home to Newcastle United Football Club, also known as the ‘Magpies’. Its proximity to the A1(M) means that access to the south is easy and quick. 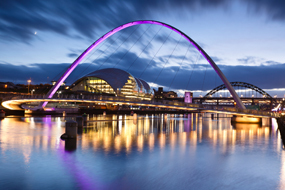 Newcastle upon Tyne is famed for is bustling nightlife as well as its bridge over the River Tyne. The city boasts several major shopping centres which are extremely popular with locals and tourists alike. The Newcastle upon Tyne windscreen fitting centre and its mobile vehicle glass technicians service the needs of Newcastle upon Tyne and the surrounding area including Gateshead, Wallsend, Gosforth and South Shields. With 108 fitting centres and over 800 mobile technicians, National Windscreens operates the UK's largest windscreen repair and windscreen replacement network. The company provides low cost, high quality windscreen replacement and windscreen repair from its Newcastle upon Tyne fitting centre 24 hours a day, 7 days a week, 365 days a year. Repair and replacement of all types of vehicle glass including windscreens, rear windows and side windows is undertaken throughout Newcastle upon Tyne and all of the Newcastle upon Tyne area.